The rolling grilles and shutters can be opened and closed using an electric drive or manually with a spring shaft. Our spring shaft is a good solution when there is no electrical connection available on-site or if there is no space for one – ideal for narrow gateways! The spring shaft drive is particularly suited for entrances to shops or for warehouse gates subject to rough use. Gates with spring shafts are rapid and easy to operate, economical, simple and quick to install, do not require an electrical connection, are durable and also exceptionally efficient and strong in busy situations and when operated roughly. A convincing alternative to an electric drive. Spring shafts are frequently used for driving smaller-sized rolling grilles and roller shutters (up to max. 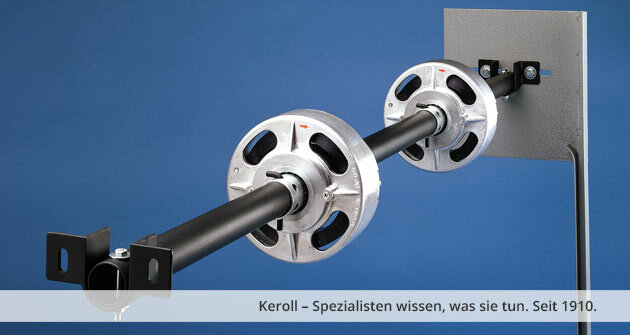 100 kg curtain weight) and provide a reliable, cost-effective alternative to conventional electric drives. The rolling grilles or shutters are fitted at hand level, and also on the end rail if required, with an espagnolette lock to prevent unauthorised lifting. The spring shafts are designed precisely according to the curtain weight of each gate or grille so that the best possible counter-balance is achieved and the least possible manual strength is required. Ideal for small gates, simple installation, easy and rapid operation, hardwearing and durable, high-quality 1a spring steel strip (made in Germany), secure and reliable spring fastening, safe due to all-round spring bandage, aluminium housing easily adjustable due to 1/6 division, hardwearing slide bearing, no electrical connection required, economical and cost-effective.